Here is a band 7 report on this topic submitted by one of our students. Send us your writing samples for a free band score estimate or get a detailed analysis of your writing for a fee. 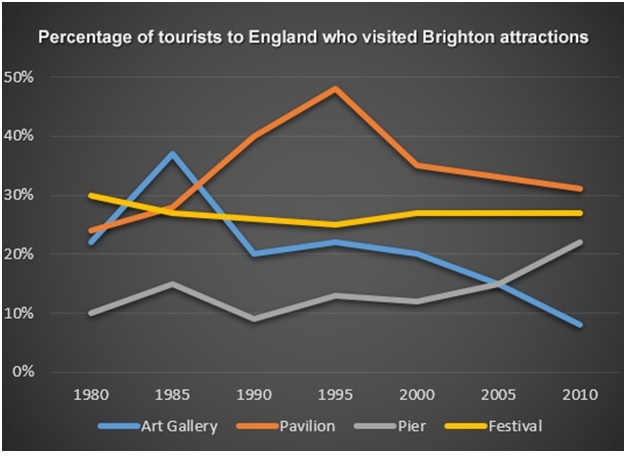 The line graph illustrates information about the percentage of visitors in England exploring the four different tourist attractions in Brighton from 1980 to 2010. Overall, it can be seen that Pavilion was the most popular attraction while pier was the least popular. To begin with, around 24 percent of tourists visited Pavilion in 1980. This figure then significantly rose to around 49% in 1995. However, interest in the Pavilion declined over the years and only about 35% of total tourists visited this place in 2000. By 2010, the visitor share had declined to almost 30%. Meanwhile, there was not much change in the percentage of people who visited festival attractions during the given period and it remained in the range of 25 to 30 percent. Visitors to the art gallery spiked (about 38%) in 1985 and afterwards it declined. In 2010 less than 10 percent of the total tourists visited art gallery. While pier got only 10% of visitors in 1980, it had more than 20% of visitors in 2010.